This popular cage has just got even better. Nearly a third larger, and much improved dimensions. Ideal as a beginner's cage, but also for the busy breeder who wants separate small cages. Excellent as an emerging cage for chrysalides and cocoons, ideal for keeping small numbers of larvae or other insects, when large enough for cage rearing. 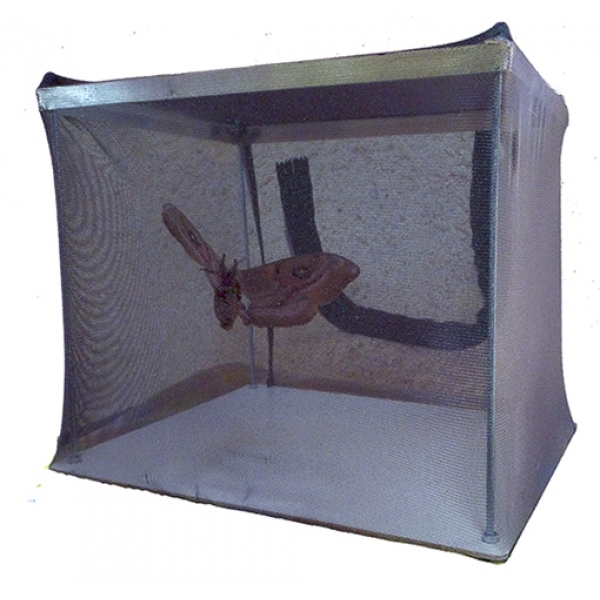 This cage is suitable for laying out small numbers of pupae to emerge. Also for rearing smaller numbers of larvae or smaller larvae. Baby larvae should be first reared in plastic rearing containers or kept covered on growing food. Please see the note on the page for plastic rearing containers. This cage will hold small covered pots of plant, and larger sizes of cage are available for larger subjects. When necessary the netting cover can be slipped off for cleaning or replacement. The Pyjama Mini cage is assembled in minutes and easily packed flat for winter storage. As the interest grows there are larger sizes available. For the experienced breeder the Mini Cage has many uses where a series of smaller cages is needed for separating species and giving different treatment.